Specifying insulation that extends a roof system’s performance life is essential, but it is only one-factor building owners and managers must consider. When managers select roof insulation, they also must account for the building’s thermal needs, satisfy applicable energy codes, and deliver a roof assembly acceptable to your facility’s insurance carrier. To perform successfully, insulation has to become an integral part of the roof assembly and must function in concert with the membrane and the structural deck. Wise insulation choices result in successful roof systems that perform over the long term, while poor choices can be detrimental to roof performance. We can help you select the best option for your needs. Below, we discuss the 4 typical types of roof insulation. A variety of rigid insulation types are available to you, including wood fiber, perlite, polyisocyanurate, expanded or extruded polystyrene, cellular glass, and gypsum board. Wood fiber is an organic insulation board composed of wood, cane, or vegetable fibers mixed with fillers and binders. The insulation can be asphalt impregnated or asphalt coated to enhance moisture resistance. You may want to consider uncoated insulation in applications where the selected roof covering is incompatible with asphalt-based coatings. Perlite insulation board is composed of inorganic, expanded siliceous volcanic glass (perlite) combined with organic fibers and binders. 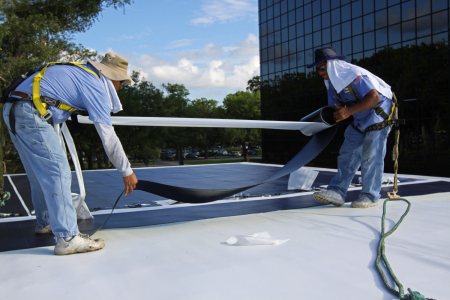 The top surface of the insulation board features an asphalt coating or a proprietary coating formulated to limit adhesive — asphalt — absorption into the insulation during the roof-membrane application. Polyisocyanurate is a closed-cell foam plastic insulating core sandwiched between organic or inorganic felt facers, glass-fiber mat facers, or glass-fiber-reinforced aluminum foil facers. A blowing agent expands the foam material, creating the closed-cell structure that gives the insulation its high thermal resistance. Polyisocyanurate’s insulating efficiency remains higher than other rigid insulation. Gypsum Board is a non-structural, non-combustible, water-resistant, treated gypsum core panel. The board is available with a proprietary, non-asphaltic coating on one side to enhance roof-membrane adhesion. Gypsum board typically is used as a cover board over foam-plastic insulations, as a thermal barrier over a steel deck, or as a vapor-retarder substrate. There are numerous ways of increasing thermal resistance with insulation, which offers you the opportunity to save thousands of dollars in operating costs. On your next project, we’ll work with you to find the solution that fits both your needs and budget. We’ll develop solutions to maximize rebates and R-Values while meeting necessary building codes.